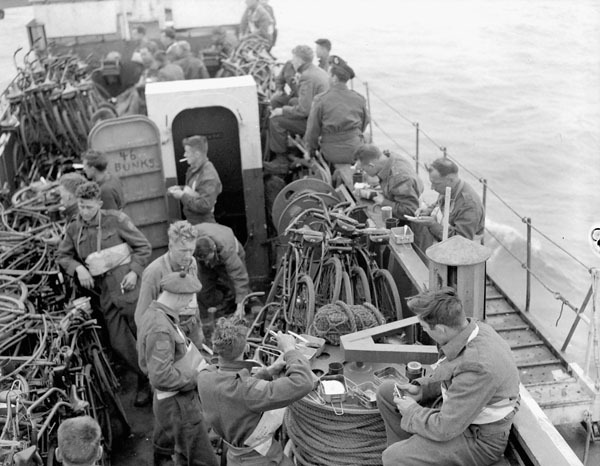 In the lead up to D-Day, Royal Canadian Navy photographer Gilbert Milne rigourously documented the load-in of Canadian army elements onto Canadian navy vessels. As the ships weighed anchor to turn towards the Normandy coast, Milne climbed aboard an infantry troop-carrier and created a definitive photographic time capsule recording Canada's contribution to, arguably, the most pivotal moment of the 20th Century. Gib Milne was born in Medicine Hat, but grew up in Toronto, apprenticing in photography with his father, Charles Milne. Gib became a freelance photographer for the Toronto Star and in early 1943 was offered a commission as a photographer in the Royal Canadian Navy. After joining up at HMCS York in Toronto, Sub-Lieutenant Milne reported for duty in Halifax. 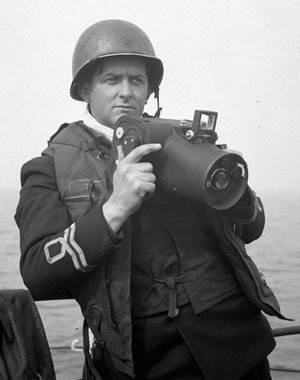 He spent the next year covering the movements of the RCN and recording the pre-invasion schemes of destroyers, minesweepers, motor torpedo boats, and landing craft infantry. 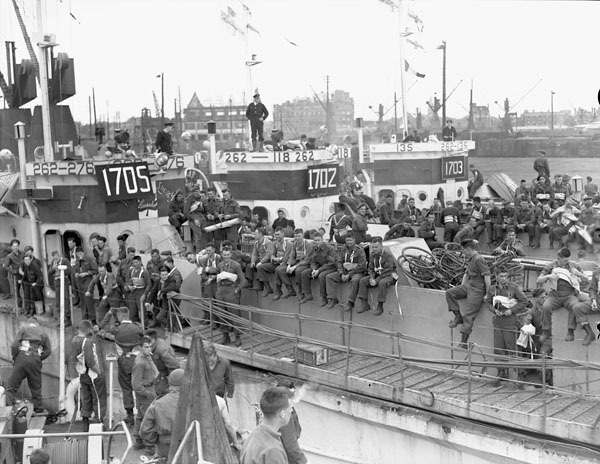 In the lead-up to D-Day, Milne was sequestered with elements of 9th Brigade on the Southampton Hards in the south of Great Britain, photographing the embarkation of soldiers onto the RCN 262nd LCI Flotilla. He was aboard LCI 306 when the flotilla weighed anchor and headed into the English Channel. 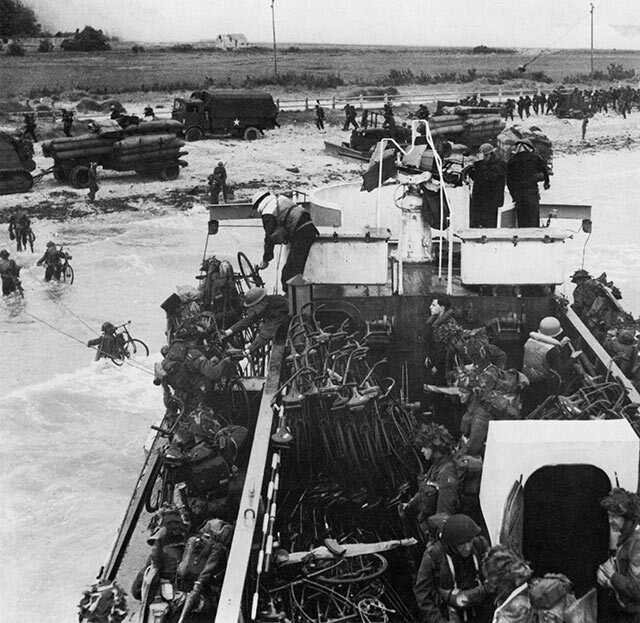 On the morning of D-Day, Milne photographed the Channel crossing and the landing of the flotilla at Bernières-sur-mer where he shot ninety-two photos of Canadian 9th Brigade disembarking onto Juno Beach. The 9th Brigade was the Canadian 3rd Division's reserve brigade. It was made up of three highland infantry regiments who were to land behind the First Wave after the Juno beachhead was secured by 7th & 8th Brigades. 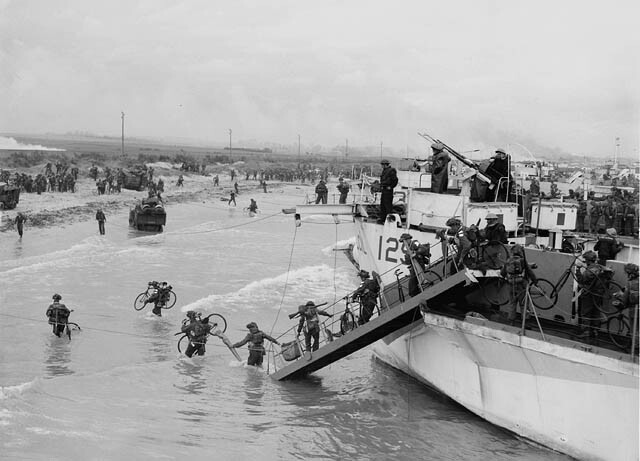 Then the 9th would move forward on paratrooper-style bicycles, on the backs of tanks, or in universal carriers, to an assembly point near Bény-sur-mer code-named ELDER. There, they would re-form into their fighting components and leap-frog through the lead brigades, taking control the attack in the afternoon of June 6th. Gilbert Milne’s photos of D-Day culminate with the disembarkation of the highland brigade troops – for once off the ships the troops disappear into the Norman countryside. Milne was, after all, a Navy photographer. But it was Milne who captured some of the most iconic photos of this monumental Canadian enterprise. His photographic essay of the Channel crossing and 9th Brigade's amphibious landing were among the first images of the invasion to be released, immediately gaining worldwide attention. 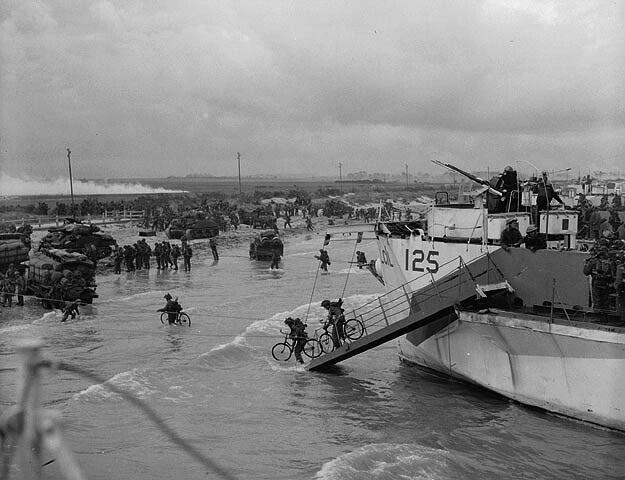 Continue below, as MLU presents a sequenced analysis and deconstruction of some of Lieutenant Gilbert Milne’s D-Day photography. 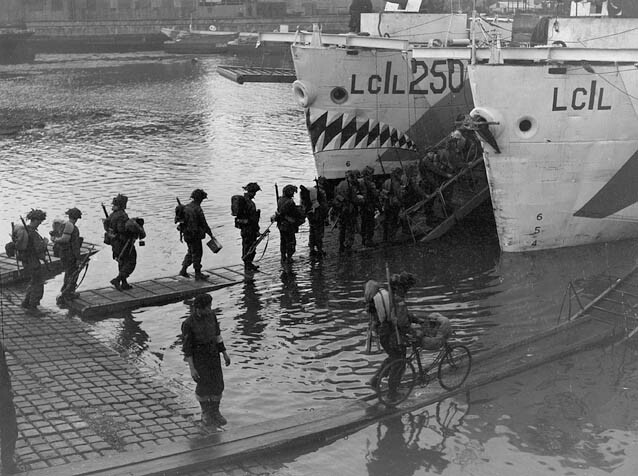 LAC caption: Troops of the Highland Light Infantry of Canada going aboard an L.C.I. (L) at dawn. Date: 6 June 1944. Place: Southampton, England. MLU note: Canadian troops of the Highland Light Infantry in Southampton on June 4th, embarking aboard LCI 250, LCI 125, and LCI 306. Each LCI had a serial number board affixed to her bridge for easy identification by the troops boarding. (These three ships are 1707, 1706, and 1708 respectively.) 1707 embarked 'B' Company and Battalion HQ of the Highland Light Infantry of Canada (HLI). 1706 embarked 'A' Company and 1st platoon of 'D' Company of the HLI. And 1708 embarked 'C' and 'D' Companies of the HLI. 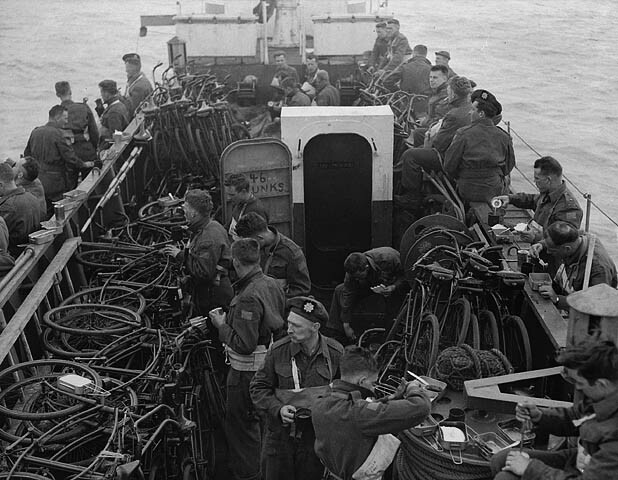 LAC caption: Canadian infantrymen en route to France aboard the Landing Craft Infantry LCI(L)s 276, 118 and 135 of the 2nd Canadian (262nd Royal Navy) Flotilla, Southampton, England, June 1944. MLU note: Probably June 4th (or the morning of the 5th). Several craft from Canadian 262nd LCI flotilla are moored together, not "en route", but still in harbour in Southampton. The serial numbers on the front of each bridge refer to serials of Operation Order No.1 of 9th Canadian Brigade, 3rd Canadian Division. Serial numbers 1702 and 1703 carried members of the North Nova Scotia Highlanders (based in Amherst, Nova Scotia). 1705 was a mixed load carrying members of the Highland Light Infantry of Canada, Stormont Dundas & Glengarry Highlanders, the Defence and Employment Platoon of 9 Brigade Headquarters and members of the Canadian Provost Corps. 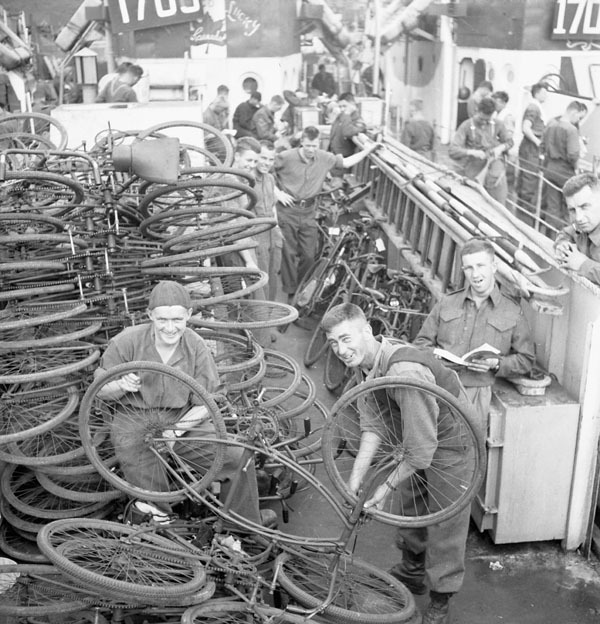 LAC caption: Infantrymen checking bicycles aboard an LCI(L) of the 2nd Canadian (262nd RN) Flotilla. Southampton, England, 6 June 1944. (L-R): Privates Reg Martin and Rodney MacNeill, both of The Lorne Scots (Peel, Dufferin and Halton Regiment); Private George Banning of The Cameron Highlanders of Ottawa (MG). MLU note: Obviously not June 6th. Probably June 4th (or the morning of the 5th). The LCI are still in harbour in Southampton. The rifle companies have loaded aboard, but the men have unloaded their fighting gear probably in the bunks below deck. 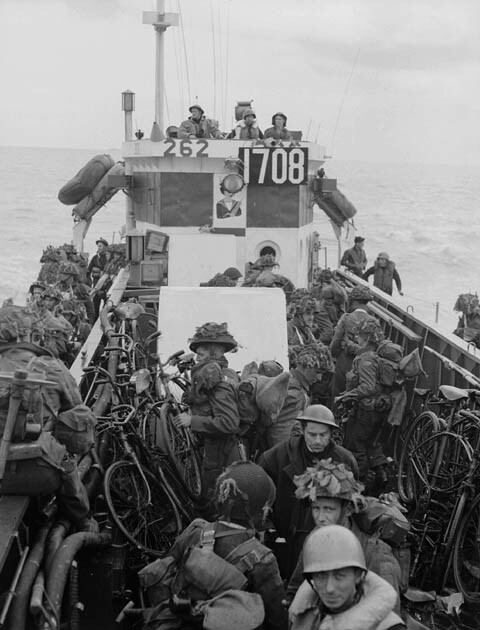 The bicycles were supposed to speed the second wave regiments to the front once they disembarked from the LCI, but the roads were far too congested and the bikes were rarely if ever used. D-Day veterans say a lot of French kids got new bikes that day. Compare this photo against the photo of LCI 276 above. (#1705 – "Lucky" with the Cdn maple leaf that says "Canada".) 1705 was a mixed load carrying members of the HLI, SD&G Highlanders, the Defence and Employment Platoon of 9th Brigade HQ and members of the Canadian Provost Corps. D.R. Martin (Regimental #C21725) was taken on strength as a Private in 9th Infantry Brigade Ground Defence Platoon on 21 April 1944, just in time for D-Day. The 9th Brigade Defence Platoon were members of The Lorne Scots (Peel, Dufferin and Halton Regiment). LAC caption: Infantrymen of the 9th Canadian Infantry Brigade aboard an LCI(L) of the 2nd Canadian (262nd RN) Flotilla, Southampton, England, 6 June 1944. (L-R): Privates Art Robertson and Ken Marden. MLU note: Probably June 4th (or the morning of the 5th) – the LCI are still in harbour in Southampton as suggested by the masts in background. RCN #262 Flotilla didn't cast off till the afternoon of the 5th, when the LCI moved down the Southampton channel. 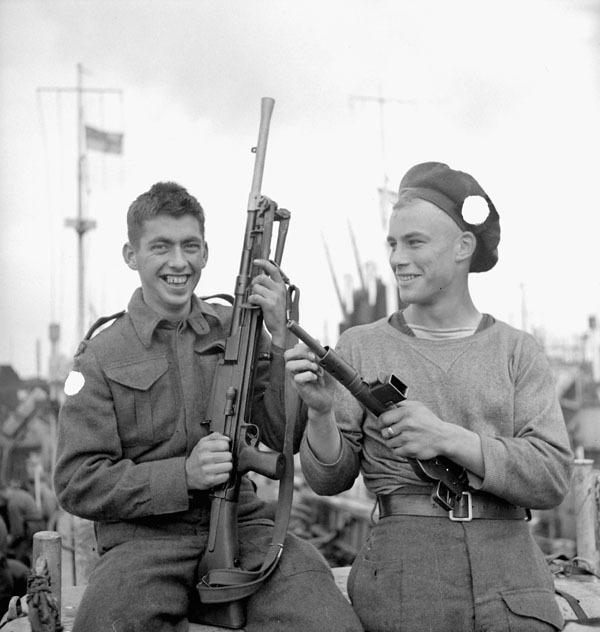 In this photo, Robertson holds a Bren gun and Ken Mardon (misspelled above) holds a Sten gun (though privates carried rifles so this must be borrowed from a section leader). Both men (boys really it seems) are sharing a laugh while waiting for the show to start. The wartime photo censor has whited out their regimental markings, but we know from a similar uncensored photo that Mardon wears a Highland Light Infantry cap badge. And it looks like there is a 'Canada' flash below the shoulder flash on Robertson, suggesting he is a North Nova Scotia Highlander. 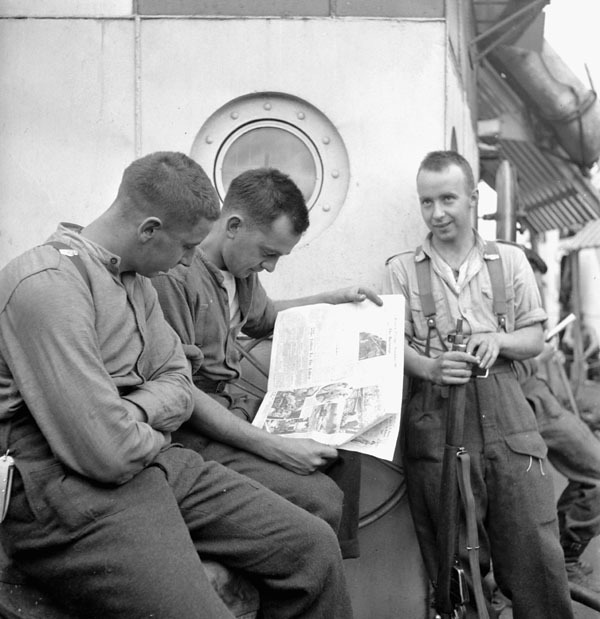 LAC caption: Infantrymen of the 9th Canadian Infantry Brigade aboard an LCI(L) of the 2nd Canadian (262nd RN) Flotilla reading the news of the Canadian entry into Rome. Southampton, England, 6 June 1944. (L-R): Lance-Corporal Bill Dudka, Privates Leo Janisse and Leon Ruston. MLU note: Bill Dudka (brother of MLU interviewee Stan Dudka) was in the Provost Corps, so this photo is most likely taken on LCI 276 (#1705 - "Lucky" with the Cdn maple leaf that says "Canada") as seen in photos above. LCI 276 was a mixed load carrying HLI, SDG Highlanders, the Defence and Employment Platoon of 9th Brigade HQ and members of the Canadian Provost Corp. If so, this LCI is still in port in Southampton because when the flotilla departs, photographer Milne is on LCI 306. 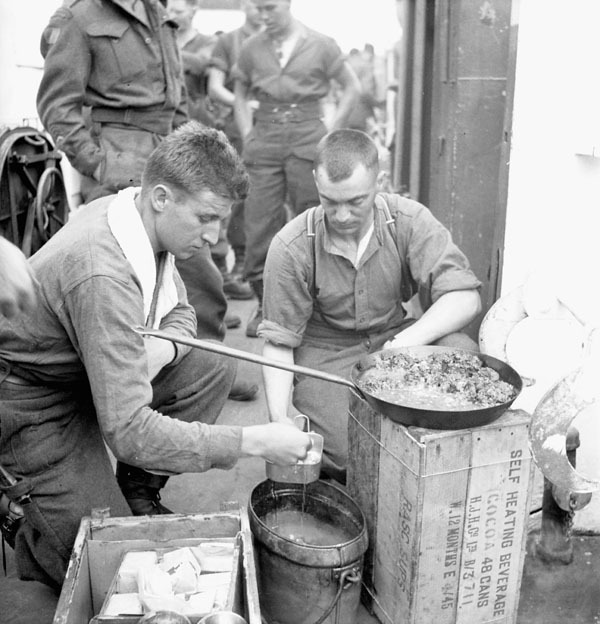 LAC caption: Infantrymen of The Highland Light Infantry of Canada cooking a meal aboard LCI(L) 306 of the 2nd Canadian (262nd RN) Flotilla en route to France on D-Day, 6 June 1944. 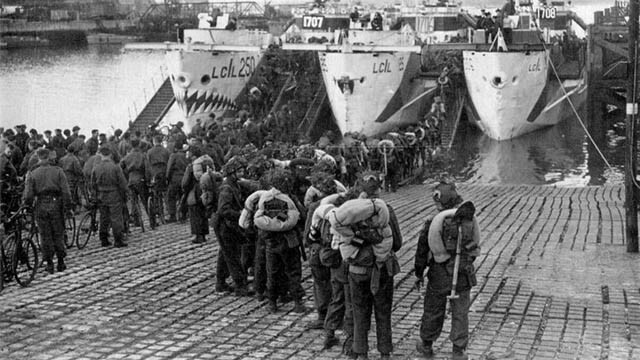 MLU note: The LAC description says they are on route to France on D-Day. If so it would be the early morning of June 6th. Once RCN 262nd LCI Flotilla unmoors at Southampton, Gib Milne is aboard LCI 306 with the HLI. This could be supper on the 5th, though we can tell from photo PA-136981 below that the men were still pretty casually dressed for breakfast in the early a.m. of June 6th. LAC caption: View from LCI(L) 306 of the 2nd Canadian (262nd RN) Flotilla showing ships of Force 'J' en route to France on D-Day, 6 June 1944, English Channel. 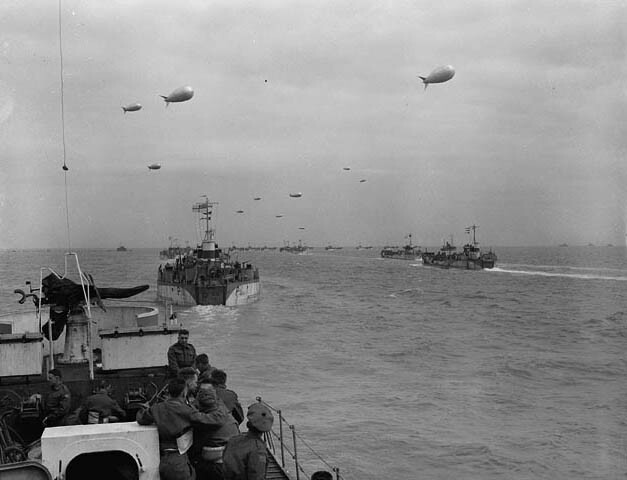 LAC caption: Invasion craft en route to France on D-Day, 6 June 1944, English Channel. LAC caption: Infantrymen of The Highland Light Infantry of Canada aboard LCI(L) 306 of the 2nd Canadian (262nd RN) Flotilla en route to France on D-Day, 6 June 1944. 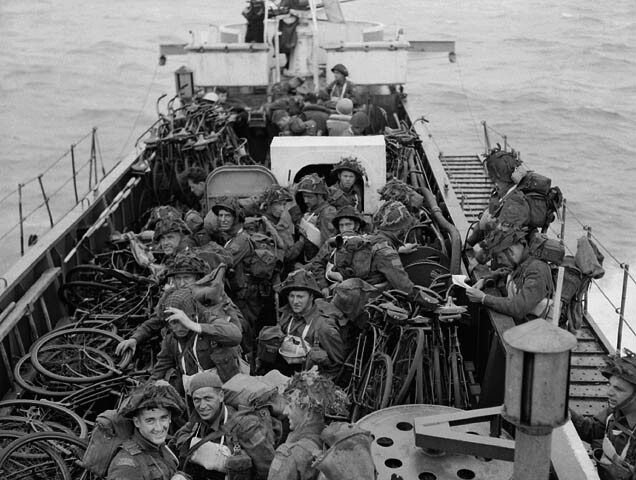 LAC caption: Canadian troops aboard LC(I)L 306 of the 262nd Flotilla, R.C.N., en route to France. LAC caption: Personnel of the Highland Light Infantry of Canada and the North Nova Scotia Highlanders aboard LCI(L) en route to France. LAC caption: View looking west along 'Nan White' Beach, showing LCI(L)s of the 2nd and 3rd (262nd and 264th RN) Flotillas landing personnel of the 9th Canadian Infantry Brigade on D-Day. 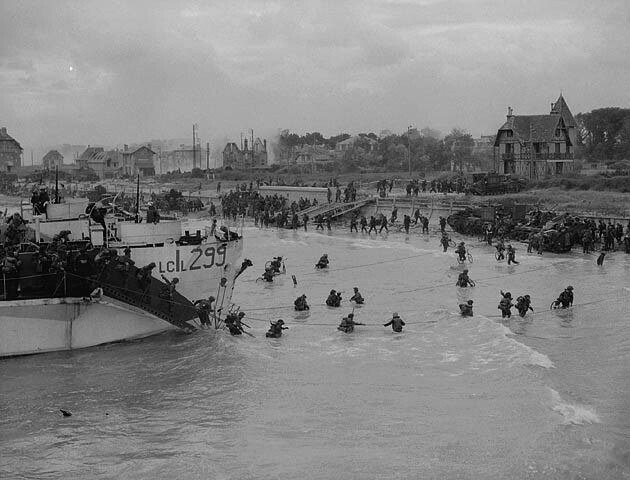 LAC caption: Canadian LCI(L)s going ashore on D-Day. LAC caption: Troops of the Nova Scotia Highlanders and the Highland Light Infantry of Canada landing at Bernières-sur-Mer, 6 June 1944. Disembarking from L.C.I. 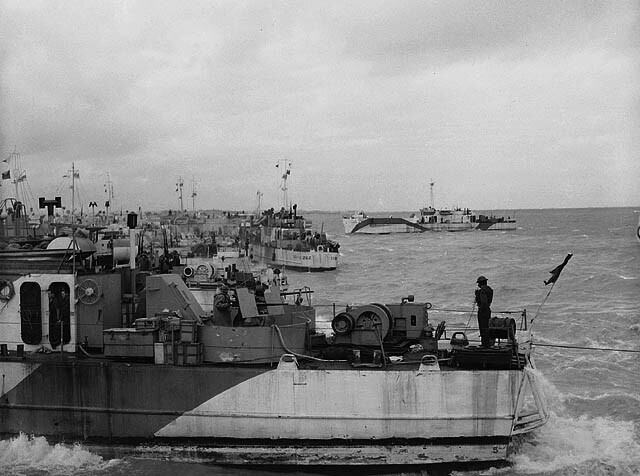 of the Canadian Landing Craft Infantry (Large) Flotilla, of either the 260th, 262nd, or 264th. 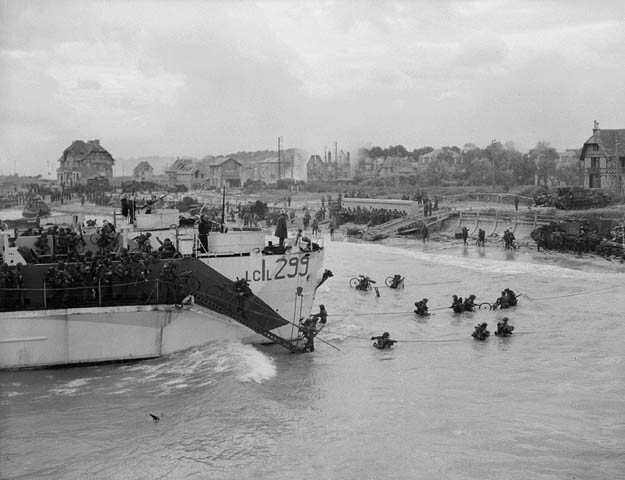 LAC caption: Personnel of the 9th Canadian Infantry Brigade landing from LCI(L) 125 of the 3rd Canadian (264th RN) Flotilla on 'Nan White' Beach on D-Day. 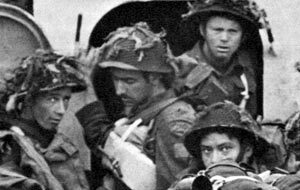 LAC caption: Infantrymen of The Highland Light Infantry of Canada aboard LCI(L) 306 of the 2nd Canadian (262nd RN) Flotilla, landing at Bernières-sur-Mer, France, 6 June 1944. 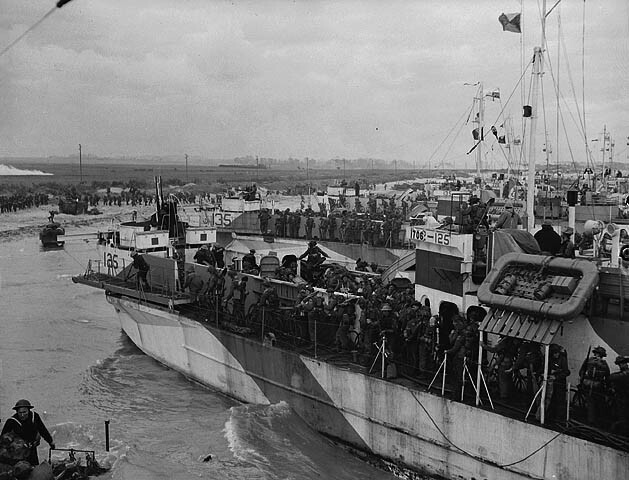 The officer standing in the bow of the landing craft is Lieutenant Gilbert A. Milne. 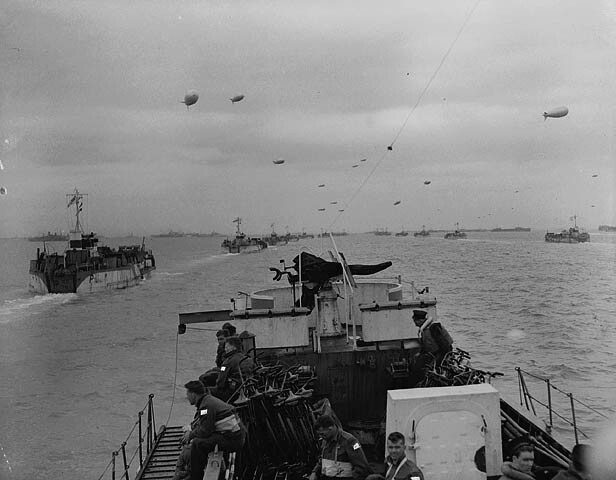 LAC caption: Personnel of the 3rd Canadian Infantry Division landing from L.C.I. 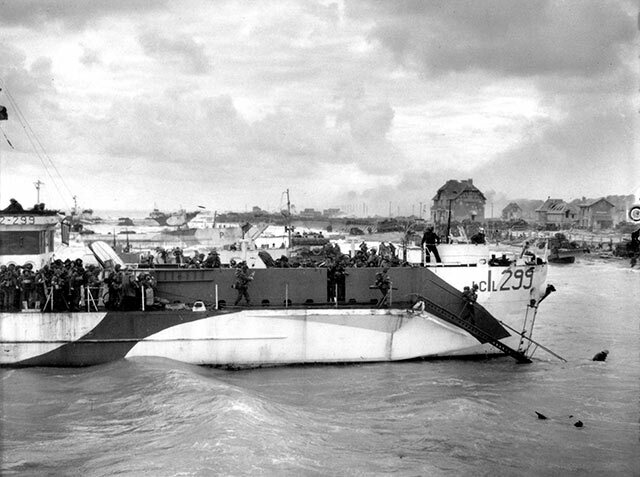 (L) 299 of the 262nd Flotilla. 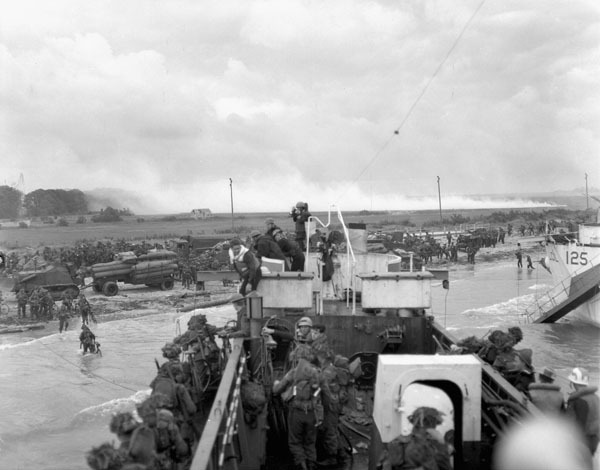 LAC caption: View looking east along 'Nan White' Beach, showing personnel of the 9th Canadian Infantry Brigade landing from LCI(L) 299 of the 2nd Canadian (262nd RN) Flotilla on D-Day. MLU would like to thank Gilbert's son Michael Milne and the rest of the Milne family for their kind words and support. Glenn Warner is a cinematographer, photographer, and photography historian.